"If I could tell everybody something about trucking, it would be that there are heartbeats in the truck"
A couple of links over at Steve Quayle's website on Sunday caught my eye: First one about upcoming Trucker's strike scheduled for April 12, 2019 and the second one from Business Insider explaining exactly what to expect if long-haul truckers stopped, from day one, into the day two-three scenario, then as long as a week, and it isn't pretty. 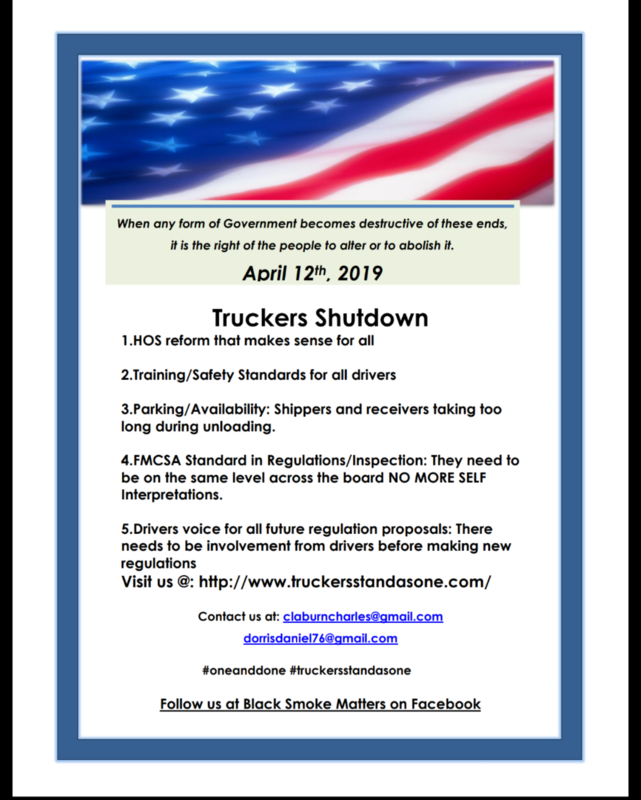 The first story about the planned Trucker's strike itself was written on January 2, 2019, detailing how a Facebook group called "Black Smoke Matters" is calling for a one day nationwide strike on April 12, 2019, to protest the "state of trucking." As of that Jan. 2 story the group's Facebook page had 9,000 members, the same number referred to in an interview with Charles Claburn, the organizer of the event, published on January 11, 2019. While Claburn's group "Truckers Stand As One," is not part of a union, the members are scattered all across the country, and at the rate of growth seen over the last 30 days, we are talking tens of thousands of truckers potentially participating by the time April rolls around. The goal is garner attention to issues harming truckers, in an industry that is already seeing a shortage of drivers, that is expected to triple to 175,000 drivers by 2026. In Claburn's interview he lists the issues he and the others are concerned about: The first issues listed is HOS (hours of service) reform that makes sense. The second is parking, where there is an approximate shortage of 78,000 truck parking spaces, which grows from 1,000 to 1,800 a year. Third on his list is driver training and having set standards for all drivers. Lastly they are requesting that drivers be involved in the process of making new regulations. 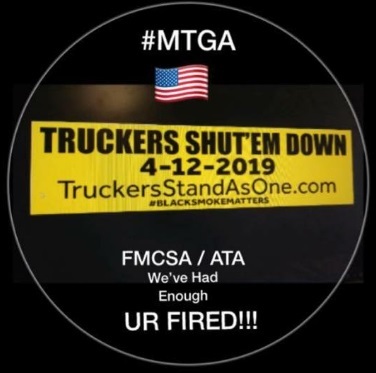 Since their initial attempt to resolve the issues with government officials in Washington D.C., truck drivers have formed many Facebook groups and have made many attempts to reach out to government officials. Monday Information held a media blitz and visited many different government agencies in April 2018, to no avail. The United States Truckers Alliance and Black Smoke Matters visited officials from the FMCSA during an event called "That's a Big 10-4 On DC" in October 2018 and still truck drivers feel as if they aren't being heard. What will it take for truck drivers to be taken seriously? In Claburn's interview with American Trucker, he explains that this strike would not include blocking roadways, and why he believes even younger drivers would be willing to participate at the risk of losing their jobs. Claburn expands on that by stating "There is a risk to anyone who stands up for anything. But remember this, there’s a driver shortage; isn’t that what they keep telling us? If a company is going to fire you for taking the day off to support your industry, I’m pretty sure the driver can find a job tomorrow. The industry can’t have it both ways. They can’t say there’s a shortage and then say because a guy is going to participate in a movement to stand up for better industry standards that they’re going to fire them." With the increasing truck driver shortages set to triple over the next seven years, the reason the increasing unhappiness and complaints of the growing number of Independent trucking groups that are sprouting up is so important, is the necessity of what they do, which is where the second link from Quayle comes in, titled "Grocery stores would run out of food in 3 days if long-haul truckers stopped working." It begins with "Trucking moves 71% of the freight in the United States. And if it were to suddenly cease, the effects would be more drastic than you might expect." The report also explain "News of a truck stoppage — whether on the local level, state or regional level, or nationwide — will spur hoarding and drastic increases in consumer purchases of essential goods. Shortages will materialize quickly and could lead to civil unrest." As Stefan Stanford pointed out in his Sunday article, it only takes "nine meals to anarchy,." Granted without the participation of the larger and/or unionized trucking companies, the worse case scenario won't play out immediately, but Independent truckers, and businesses with smaller fleets of trucks are growing exponentially compared to the larger companies, as seen in a September 2018 report at Trucks.com. According to Business Insider truck drivers' salaries have decreased by as much as 50% since the 1970s. Truckers are paid by the mile, but usually don't spend a full 11 hours driving. They might spend six unpaid hours at unloading sites, which cuts into how many hours they spend driving and earning money. With the cap now set at 14 hours of overall work a day, Wright is unable to squeeze in an extra five hours of driving after unloading his truck. 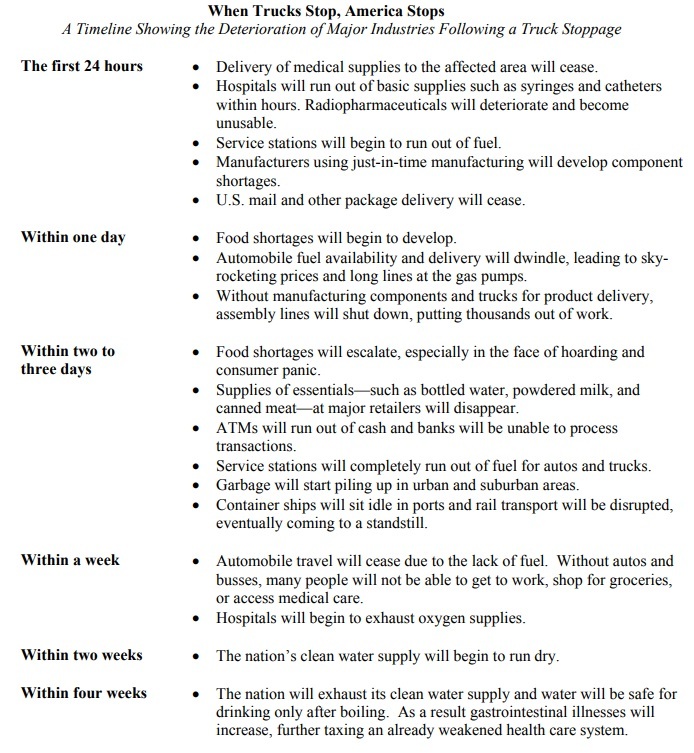 The simple goals behind the upcoming April 2019 trucker strike are not unreasonable in any manner, and they are hoping, according to Claburn's interview that the shippers will be the ones to contact their congress members and ask "what's the deal," when their carriers don't show up to load or unload because they stopped the trucks for a day. I am giving the bottom line to another Trucker, Will Kling, a truck driver based in Reno, Nevada, who previously told Business Insider, "Trucking has been forgotten. When you go to that store and you pick up that bottle of wine or that ketchup, you don't think about the process it took to get it where it is. He continued on to say "If I could tell everybody something about trucking, it would be that there are heartbeats in the truck. They don't drive themselves. We all have families, we're all just trying to do a job, like everybody else. Our job is just really different and way more dangerous." Proving there are not only heartbeats in those trucks we see along the roads but actual generous and good hearts, we see a series of videos on the Black Smoke Matters website, showing what some of their truckers spend their time doing when not long-haul driving....... feeding the homeless and hungry hot soup on cold days.